Ninety years ago, McVities introduced a triumph of miniaturisation – a biscuit-sized cake they named the Jaffa Cake. A tiny sponge cake coated with chocolate with a layer of orange jam, the Jaffa Cake because a British teatime icon. The name wasn’t trademarked, which led to other manufacturers coming up with “Jaffa Cakes” of various qualities being sold by other companies worldwide, but in the UK at least the name is still very strongly associated with McVities. And there are all sorts of variants with different fillings and chocolate, but the traditional version uses dark chocolate. 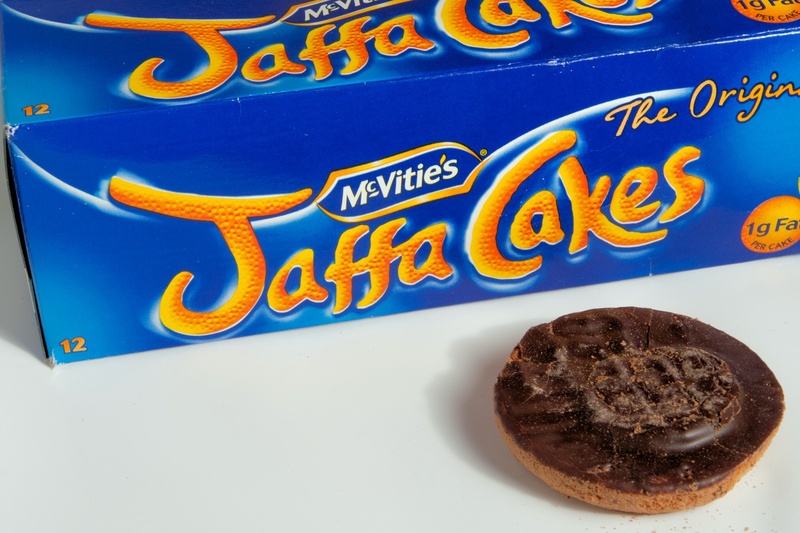 The Jaffa Cake itself was at the heart of a legal battle between the UK’s Customs and Excise department and United Biscuits, who own McVities. The Revenue contended that the Jaffa Cake was actually a biscuit (primarily due to its size and the fact it is sold on the biscuit aisle of shops), UB said that it was a cake due to its texture and the fact that when stale it goes hard, and a biscuit does the opposite. In the end it retained its status as a cake, even though a wholly unscientific recent poll indicates that many people think it is a biscuit. There is quite a market around Jaffa Cake collectables such as mugs and toys, but if you want a packet of McVities Jaffa Cakes to eat then they are about £1 for a pack of 10.